For years the origins of the colonial holidays have been exposed by honest researchers. Those origins reveal a very terrifying history of colonial barbarism, genocide and deceit. This deceit not only keeps many ignorant of the true origins of today’s celebrated holidays but also seems to trap even the families who become aware of them in continuing on in “the spirit of the holidays.” A look into humanity’s original holidays can supply us with holidays which we can substitute for today’s political holidays. Maybe if we return to our Ancestral holidays, we can break out of the cycle of perpetuating ignorance and a negligence of evil which we are inappropriately passing on to our children as holidays. It is ironic that the “Holiday Season” falls at the end of the Gregorian Year in the months of November and December. The names of these months will serve as our starting point for unearthing the dishonesty that is infecting our lives. The word November originates from the Indo-European words: novem meaning nine and mensis meaning month. The word December originates from decem meaning ten and mensis meaning month. Why would human cultures all around the world, which call themselves developed, allow themselves to refer to the eleventh month of the year as the ninth month and the twelfth month as the tenth month? This contradiction is not hidden from our eyes. It is found in any reference book showing the origins of these words. The names of these months follow the names that were given to the months in the Roman Calendar. In the Roman Calendar, the name November was used for the ninth month, but today we confuse ourselves and our children by using the word for the eleventh month. This starting place is important because Roman culture in its political pursuits called this month by the name November for no more reason than to provide their own names and calendar cycles in their pursuit to enslave the world under the Roman authority. Today, as we claim to be evolving into new heights of human genius, we must honestly admit that we are continuing to follow this calendar without any other logical reason than perhaps to show reverence and solidarity with our Roman predecessors. Is this why you use the names November and December? The world around us is full of deceptions. Politicians and those seeking power can tell us anything with the intention of misleading or taking advantage of us. The one tool that we always have at our disposal is our method of investigation. No matter what intentions one claims to have, or who one claims to be, we can always investigate the path which they have taken to cross our own. Their history will tell us much more than their mouth ever could. The problem is that this tool has been silenced in the average citizen of the colonial territories. The backwards traditions that we have adopted during the colonization process seem to hook us so well with the vices of fun, comfort and convenience that our motivation to expose their true faces atrophies and dies. Plantation, which was a settlement of the English puritans (religious radicals) who arrived in “The New World” after having been exiled from England. William Bradford served as an assistant to the Governor of Plymouth Plantation. Many historians have concluded from Mr. Bradford’s writings that the true reason for this initial Thanksgiving was the increase in personal harvest for certain farmers because of the Governor’s recent decision to shift away from a system of communal farming toward a system of private farming. No longer were the Plymouth farmers forced to share their crops amongst the Plantation communally, but now they could grow what they needed individually, and this increased the yields each farmer kept. A celebration was held in honor of the Governor’s decision, and people showed their gratitude for the chance to keep their yields to themselves. European slavery had taken him away from his home on this continent and across the Atlantic into the European continent. His will to survive and return home brought him back only to find that his beloved Pawtuxet had been wiped out by the smallpox epidemic. From that point, Squanto lived as a slave of the puritans on the Plymouth Plantation. His strong will and intelligence served them tremendously, he taught them agriculture and fishing. He worked out a treaty between the Plantation and the neighbouring Wampanoag Indian Nation. At the end of the first year of the treaty, a feast was held at Plymouth Plantation. 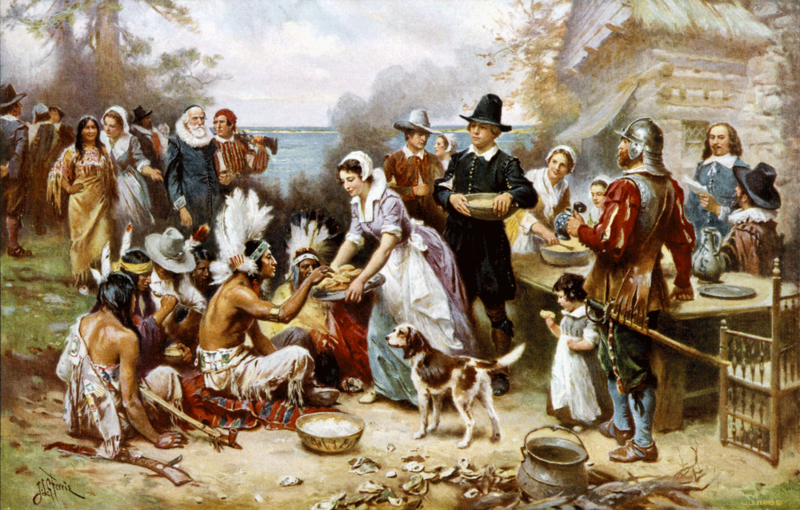 Crop yields were high due to Squanto’s traditional expertise, and members of the allied Wampanoag Nation also came bearing contributions to the feast. There were three days of celebration. The harmony amongst the Plymouth Plantation and their Indigenous neighbors was short lived. More English migrants came to the New World, and the Plymouth Plantation moved inland, forcing themselves onto other territories. 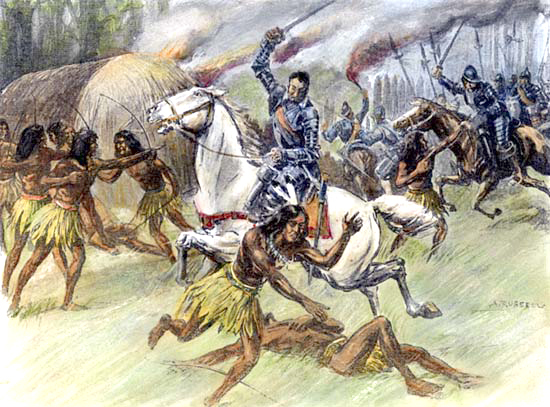 The Pequot Wars soon followed. The Pequot was a very strong Indian Nation who did not give an inch to the Plymouth Plantation or any other European migrant group. In 1641, the Dutch governor of Manhattan offered the first scalp bounty (a common practice in many European countries at the time). This, together with the Puritans’ bounty for Natives to be sold into slavery, increased the aggression towards the Natives. The Dutch and the Puritans joined barbaric forces to defeat the Pequot. In what is now Stanford, Connecticut, the churches of Manhattan announced a Thanksgiving for the war successes. A big feast was held. During the feast, heads of decapitated Pequot Indians were kicked through the street like soccer balls. Similar days of Thanksgiving were held after every subsequent massacre in each respective town. George Washington, American Hero and first president of the colonies, brought some organization and schedule to these celebrations and restricted the celebrations to one day that could celebrate the success of the migrants’ barbarism around the nation. In 1863, Abraham Lincoln decreed the day to be a national holiday. Lincoln’s decree came on exactly the same day he ordered troops to march against the Sioux in Minnesota – perhaps his way of taking part in the celebration and its true legacy. Such is the true face of the Thanksgiving holiday. It was initialized with a celebration for either a turn away from cooperative living or a celebration for the success of the genocide of the Native tribes found by the Puritans upon their arrival in the New World. Either way, the most fundamental and long-lasting parts of the celebration are the gratitude for the genocide and massacre of the indigenous populations of this continent. But let’s not only shine a light on the direct line of the origins of our national holiday. 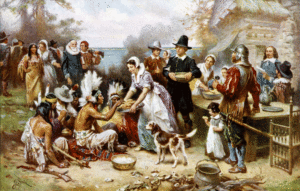 The Wompoanoag held six thanksgiving feasts per year, and one of these feasts may easily have influenced the first of its kind amongst the puritans of the Plymouth Plantation. These were held for different cultural reasons, one being the yields of the yearly Cranberry harvest. This is not unusual, indigenous people all around the world hold celebrations to show their gratitude to the Gods and supernatural forces of existence that provide the harmony and the conditions for their survival and the survival of their crops. These indigenous holidays more than likely grew out of the Kemetic holidays which preceded them with the exception of those which were coined for new situations and environments that each indigenous group faced in their own location and particular experience. In the original Kemetic calendar, in the month of Ateeri, which begins around November 9th of the Gregorian calendar, there is a very important spiritual holiday known as The Death of Wsr. The Death of Wsr is the anniversary of the death of the God Wsr or Ouziry, known by the Greek territories as Osiris and by differing names around the world. The God Wsr is the first God of the Second Trinity of Gods presented in the Original Kemetic Cosmogony or creation story. The Second Trinity of Gods is also known as humanity’s Ancestral Gods because through their decisions and experiences, humanity was given a chance to exist. The God Wsr was the first God to die. The God Wsr chose to live out his immortality — one of the basic qualities of every God — through the path of transcendence. This meant that he would die but his essence would transcend through his children and through them he would be given a resurrection. It was with Wsr that all of the religious stories of reincarnation and resurrection were inspired. It was the dichotomy between Wsr’s son Heru and his brother Seth that would inspire the dichotomies found in all cultures around the world, such as the most well-known philosophical concept of the same nature: the Yin and Yang of Eastern philosophies. Wsr was not only special to humanity because his choices are at the origin of our existence, but also because Wsr played perhaps the biggest role in the enlightenment of humans. As a God, Wsr took the responsibility for the progression of humanity into his own hands and, in doing so, taught humanity spiritual refinement, medicine, agriculture, astronomy and time division. Wsr’s death has been observed since the beginning of human civilization as a day of mourning and lamentation. On this original holiday, we mourn the death of Wsr. Though his choice for death allowed room in existence for our existence, his death still is of great sadness to us. We see the death of Wsr throughout the Earth at this time, for it is in this time that, due to the Earth’s distance from the Sun, many plants are dying, only to be resurrected in the cycle of life, a cycle that we owe to the decision of the God Wsr. It is because of this that Wsr is known as a vegetal God. It is because of this that Wsr is also known as a lunar God, as the cycle of the moon also serves to represent his death. In death, Wsr was cut into fourteen pieces, just as the waning of the moon is portioned into fourteen phases until it begins to replenish those fourteen phases towards its resurrection on the night of the full moon. Celebrations around the world in this time show a connection to the concepts highlighted on this original holy day, many of which have become simplified to a show of gratitude for the agricultural cycle, a cycle that is heavily associated with the God Wsr. In Ghana, there is a festival that is held in the Upper Eastern regions by the Paga culture known as the Fao festival. This festival is a harvest festival that honors the Gods for the abundance of the harvest. In the Phillipines there are two festivals, the Kalimidan Festival (Nov 21st) and the Sandurot Festival (Nov 22nd) where the people of the Mindanao region and Dumaguete (respectively) unite with other ethnic groups to celebrate unity and cultural sharing. However, some festivals are even more revealing. In Thailand there is a festival named Ooc-Om-Bok in which offerings and ceremonies are held to the Vietnamese lunar God. Another Ghanaian festival held by the Essumeja in the Bekwai District at the end of “November” is a festival known as Nkyidwo. This festival is held in the Asantemanso forest, known to be the Ancestral site of the Asante. This festival celebrates the Ancestral heritage of the Asante. Another Ghanaian festival in November is the Kwafie festival, a purification ceremony which uses fire. There is also a Nigerian Festival known as the Mmanwu Festival which also celebrates the Ancestral heritage of the Igbo people. These global festivals show humanity’s honest attempt at gratitude and evolution towards higher levels of development. If the citizens of the colonial territories of the world have any interest in the preservation of the integrity of humanity and the preservation of logical human customs, perhaps it is time we re-awakened to the true power of the holy day. The disregard for honest spiritual and intellectual pursuits in the legacy of our Ancestors is a testament in itself to the loss that humanity suffered when the God Wsr died on Earth. However, the festivals that continue in his legacy of preserving and perpetuating life and seeking new levels of human purity and evolution attest to his power of resurrection. The God Wsr has taught us many things. One of the most important things that his life as described in the Kemetic Holy Drama (lecture available at The Earth Center schools) has taught us is that every decision the human being faces is a decision between destruction and construction, to stop life or to preserve life. We must put aside the destructive lies that have been perpetuated on the world by those seeking power and bring our families together this year to return to our Ancestral holy days. This year, the Death of Wsr falls on the Gregorian Date of November 25th. The Death of Wsr is observed with a fast from sunrise to sunset. During the fast, no one is to eat, drink, smoke, curse or procreate. Throughout the day, time is given towards prayer, lamentation, and mourning. At sunset, the fast is broken with the ablution and zemzem (Original Kemetic Spiritual Purification and Prayer, taught at The Earth Center schools) and a feast may follow amongst friends and family.